Swedish design studio Claesson Koivisto Rune has come up with a stove for the developing world that uses two-thirds less wood than a traditional cooking fire (+ movies + slideshow). 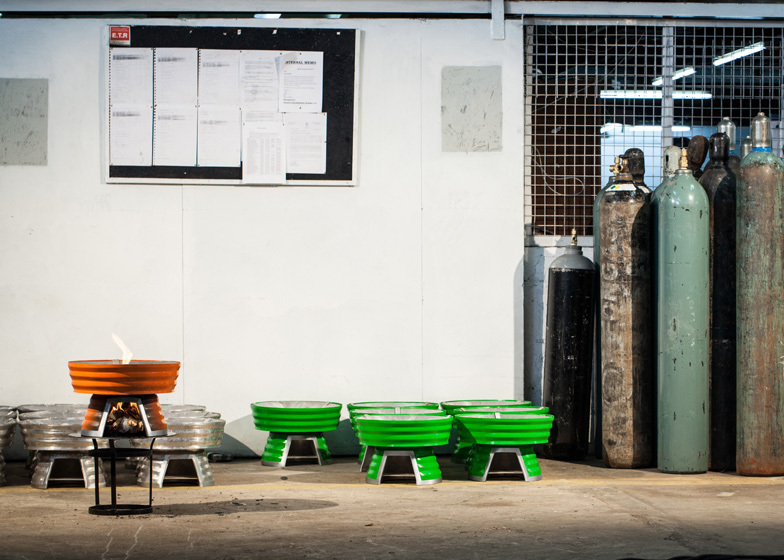 The Baker Cookstove was designed by Claesson Koivisto Rune for Top Third Ventures, a company set up in 2011 to sell stoves to low-income households in developing countries, with the aim of improving the health of users and lowering carbon dioxide emissions. 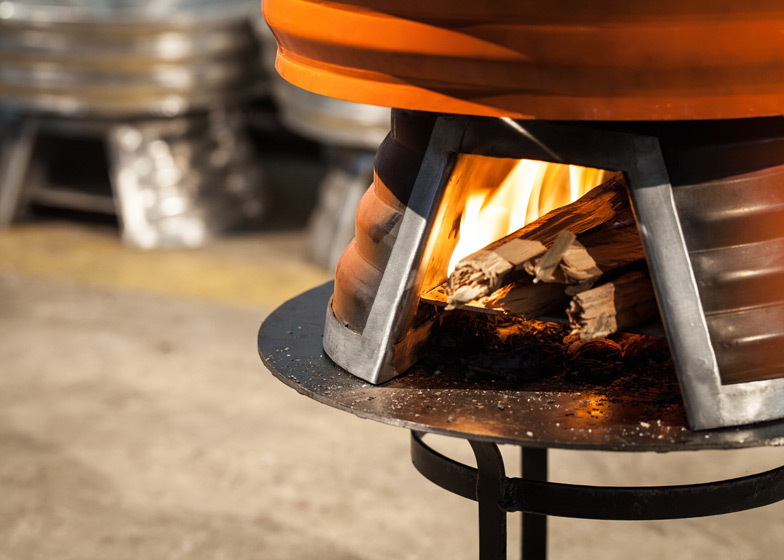 In countries like Kenya, where the Baker Cookstove is being launched first, cooking is traditionally done on a three-stone fire – an open fire over which a pot is balanced on three rocks. 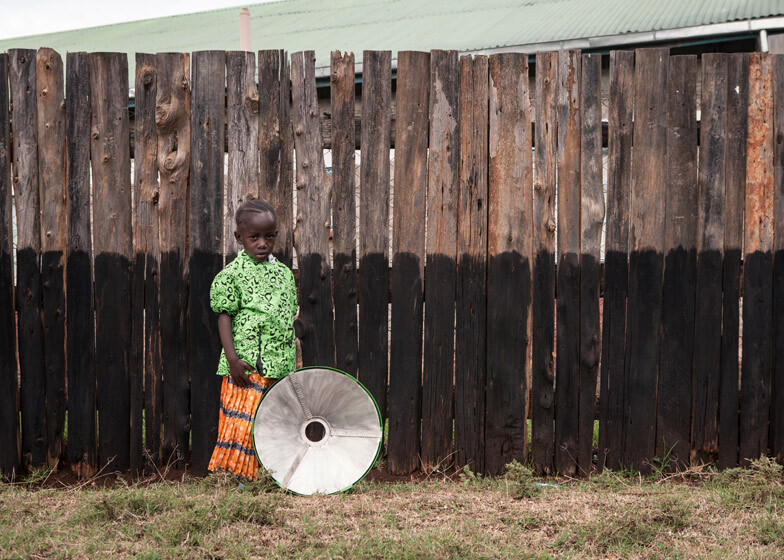 This inefficient method not only requires lots of firewood, resulting in children being sent long distances to fetch wood instead of attending school, but also creates a large amount of lung-damaging smoke. Claesson Koivisto Rune came up with a compact stove made from recycled aluminium that requires only a third of the amount of wood normally used for a three-stone fire. 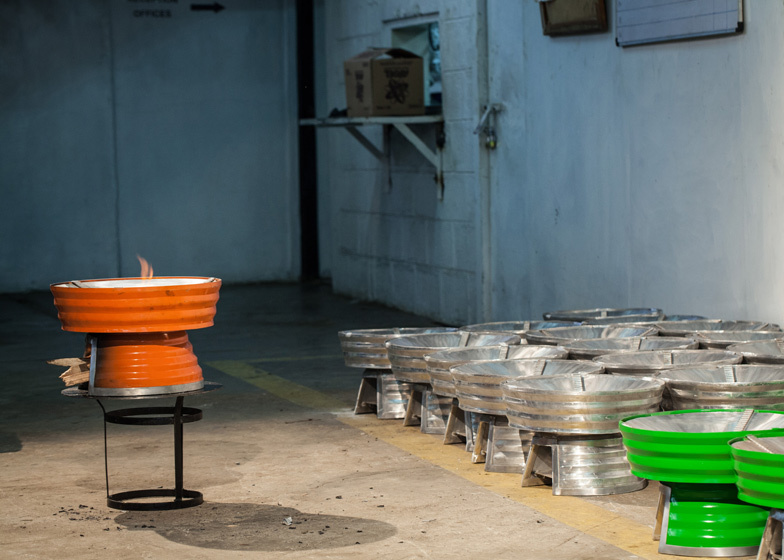 Tests at the University of Nairobi showed the Baker Cookstove achieved a 56% reduction in carbon dioxide emissions and a 38% reduction in smoke particles. 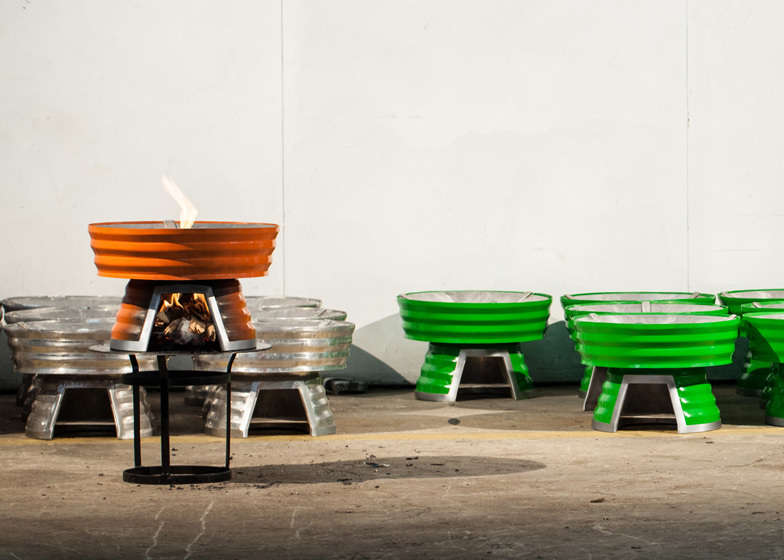 The shape of the stove and its bright colours are intended to resemble traditional African cookware. "As designers we need to put the same effort into an African stove as if we were designing an Italian sports car," said the designers. We previously featured an aid kit that nestles between Coca-Cola bottles to bring medicine to remote locations and a bicycle-powered electronic waste recycler designed to save lives in developing countries. Other cooking tools we've published include a liquor-distilling kit that breaks down into innocent household objects and a barbecue that chars food with geometric patterns – see all cooking design. Claesson Koivisto Rune's recent products include a chair with armrests that reach out for a hug and a family of small pendant lamps in bold colours – see all design by Claesson Koivisto Rune. The majority of women in the developing world prepare food on a technology called a three-stone fire. It is basically three rocks that support a pot with an open fire in the middle. This cooking method is very inefficient and leads to many environmental and health problems, one very real side effect being that children are denied education and futures because they are sent to collect firewood, wood that every day is founder at further distances. The walk takes all day and leaves no time for school. However, since the three-stone method has been a tradition for thousand of years, a new stove must allow the user to keep their way of life intact to be successful. The solution is to make a stove that burns wood, but as efficiently as possible. The design approach has really been the same as with any design project. Design is about solutions – function, usability, unification – and about adding an immaterial – humane, aesthetic, iconic – dimension. You can still cook over burning wood, but with the Baker stove you need only one third of the wood of before. In numbers from tests at the University of Nairobi the Baker Cookstove achieve a 56% reduction in CO and 38% reduction in particulate matter. Local methods of cooking, tools and containers were studied as inspiration and to gain cultural insight. As a result the final shape of the Baker Cookstove as well as its strong colours are reminiscent of traditional African cookware. The goal was to design a subtly iconic object. A functionalistic design, yet recognisable and memorable. The road up to the final incarnation has turned several times after research and performance optimisation changed the technical parameters. There are good reasons for each and every design choice, like the use of recycled aluminium and the trapezoid folding that correspond to weight, heat transmission, sturdiness etcetera. The somewhat eye-opening obvious fact is that we all have an emotional relationship with our objects. The psychology is no different if you have less or have it all; if you relate to a basic cookstove in Africa or a high performance car in the streets of Europe. To hand out functioning but crude and cheap cooking tools to "the poor" is commendable but condescending. Would I myself really appreciate a cheap and ugly tool offered to me because it "works and improves my life"? Maybe that's not good enough. As designers we need to put the same effort into an African stove as were we designing an Italian sports car. The Baker stove project has inspired us not for the prospect of making money, not for the design itself, but for the extraordinary satisfaction of actually making a tangible, positive difference in many people's lives and for the environment. And eventually, if the end users will come to tell us that they are proud to own this stove, our day is made.